Calluna Callisto Birch Trees from Firespiral Slings is a blend of 50% Merino lambswool & 50% combed cotton. It weighs in at 335 GSM, which makes it a thicker wrap. Calluna is woven using Firespiral's Alchemy Weave which is slightly looser and makes for lovely soft & mouldable wraps. 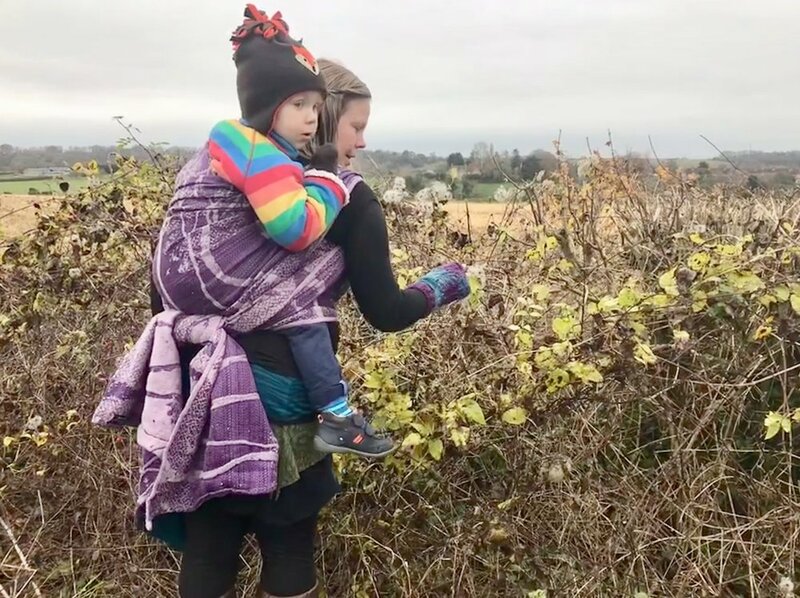 Firespiral is a British company, founded by two babywearing mothers who design their own jacquard woven wraps in-house. They are inspired by "the universal patterns in nature that stray into both science and myth; the magical way in which we are connected to the world and its rhythms". Firespiral use small, local producers and suppliers wherever possible, and have a strong focus on ecological and ethical production. I saw my first Firespiral wrap at my local sling library and loved the feel, texture and design. Many Firespiral wraps have lived here since, all different but sharing common characteristics. Firespiral wraps come with a handy cotton bag and a pin badge, as well as a guide for safe use. Callisto is the second largest moon of Jupiter and named for the beautiful protagonist of Greek legend who stirred Zeus’s ardour. It’s easy to imagine how the variegated pinstripe Callisto warp may have been inspired by either the rings of Jupiter or the beauty of Hellenic nymphs. Whichever the case, it’s stunning and as deep purple as Ritchie Blackmore. The Calluna weft is named for the flowering plant and is a pretty pink / lilac shade that perfectly complements the rich purple Callisto warp. Purple is one of my favourite colours and one that hasn’t featured too frequently in Firespiral wraps. There’s certainly never been a purple warp... now I can almost hear the ‘Twilight’ murmerings but trust me, Twilight is indigo blue and very different! If you’ve been waiting for a proper purple fix, immerse yourself in Calluna and enjoy! It glows and will brighten even a black night. The Birch Trees design is a Firespiral Slings classic and incredibly beautiful with interlocking branches, falling leaves and slender, tree trunks. There are two subtly different variations of the design and Calluna is the one with the falling leaves but no ferns at the bottom (my favourite!). From the moment you take Calluna out of its bag, there’s no mistaking it’s woolly, blanket-like qualities. Perfect for autumn and winter, it’s the kind of wrap that everyone wants to snuggle in. For those with wool sensitivities, there was a bit of ‘wool itch’ at first, but after a couple of washes and a week of wear, that has virtually disappeared. Calluna feels cushy and fairly weighty, but not so thick that it feels bulky wrapping with it. That comforting woolly texture adds a fair amount of grip, but it’s not difficult to ease the passes into place. As you’d expect from Firespiral Alchemy Weave 50% merino, there’s a nice amount of diagonal stretch which is sufficient to make a fairly mouldable yet extremely supportive and comfortable wrap. 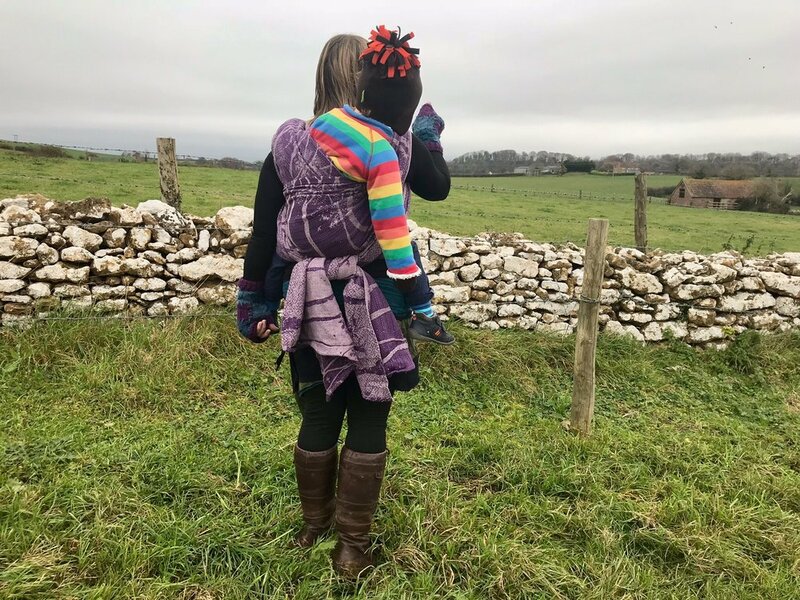 There came a time when I realised that if I wanted to continue carrying my giganta-toddler comfortably, and not have aching shoulders after a hike, then wool was the way forward. Wool blends make up over half of my stash and it’s my go to when carrying my big little in the cooler months (we’re in England so you can count that as pretty much every day save a few in June and the week in August you’re on holiday elsewhere!). You simply can’t beat a thicker 50% wool blend for cushiness and Calluna is no exception. 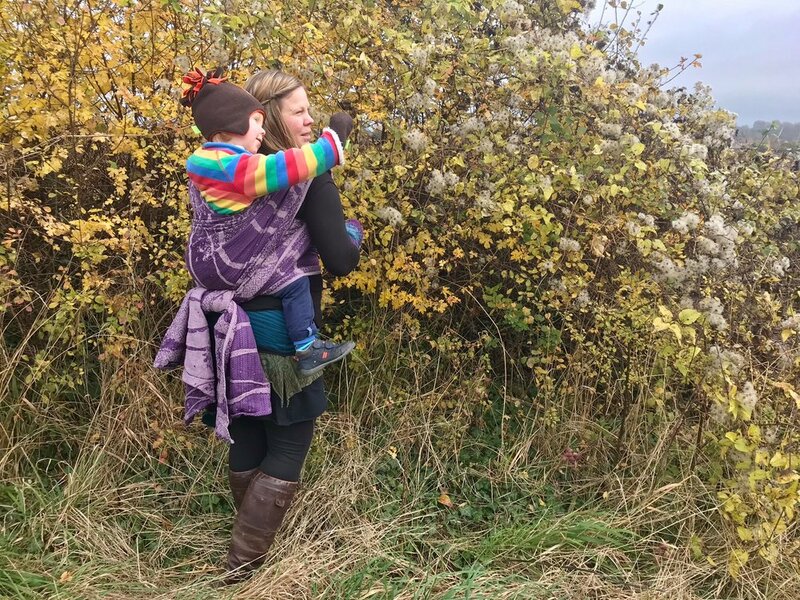 When we felt the call of the wild, Calluna made carrying even my extremely big toddler for prolonged wear a cushtastic delight. There’s all the bounce of spring lambs with zero slippage, despite said toddler vigorously attempting to hail aircraft, catch birds and hold onto passing branches! The tester was base-1 for me with my toddler and base with my 9 month old. It was like a warm cocoon against the biting wind, and not too bulky so we didn’t feel swamped. I’d particularly recommend Calluna as a base-2 or a shorty though, as it’s cushy and supportive enough in a single layer to need no extra reinforcement. As you might expect with a thicker woolly, it took a bit of effort to tie knots in Calluna (although they definitely stayed put when they were there! ), so wouldn’t be my first choice as a beginner wrap. It’d be a bit thick for a teeny newborn too, although an experienced wrapper could make it work in a single layer. I found that Calluna wraps a little bit short due to its thickness so I’d consider sizing up if you’re usually a bit short on tail. As always, you should get a bit more length as the wrap relaxes with wear. Despite being 50% wool, Calluna is machine washable (30 degrees, delicates cycle). Calluna Callisto Birch Trees is a cushy, wonderful woolly blanket of a wrap. 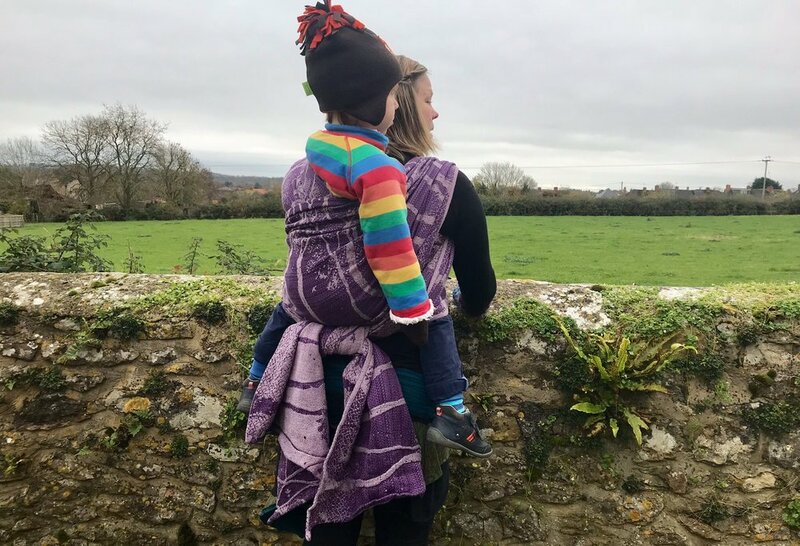 It’s supportive enough for the heaviest wrappee but not too bulky for a smaller one, though perhaps not ideal for a novice wrapper or a newborn wrappee due to its thickness. Calluna is perfect for snuggling in as a shorter wrap, but won’t swamp you in base size. Calluna will be released on 8th December and available to buy from the Firespiral Slings website. I recommend following them on Facebook for all their news and details of upcoming releases.